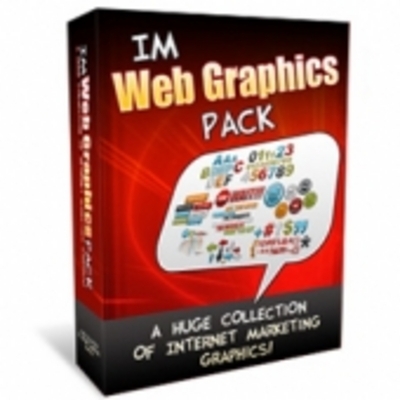 A brand new collection of over 2,600 high quality web graphics that you can simply copy and paste into your websites and blogs, in minutes. These graphics are already pre-made and pre-formatted, and are already in a "web ready" format. So it literally takes just a few minutes to stick them into your website. AND they're really high quality and polished, so you WILL actually want to use them on your sites. The quality of these graphics is what makes this package different from most other similar packages out there. So even if you already have a graphics library, this will make a great addition. Another thing that makes this package special is that all graphics come in either Transparent PNG format or Animated GIF format. Transparent PNG means that you can use the graphics element on any color background, not just white, and it will still look nice. So this gives you great flexibility with your color schemes. Animated GIF means that these are simple animations on some of these graphics, to make them stand out further. When used sparingly these simple animated graphics make a big impact, and make certain areas of a site (like the call to action button) really POP, and increase conversions. * 84 Checkmarks and Bullets (in Transparent PNG). The checkmarks come in 2 styles ("checkmark" and "x mark") and in 6 colors and 6 sizes. The bullets come in 2 styles x 1 size x 6 colors. * 144 "Call To Action" buttons (in Transparent PNG). The buttons come with 8 phrases x 6 colors x 3 sizes. The phrases are: "Add To Cart, Continue, Get It Now, Join Now, Order Now, Register Now, Sign Up Now, Subscribe Now". * 144 "Call To Action" buttons (in Animated GIF). These are the same buttons as the PNG ones above, and come with the same phrases, colors and sizes. What makes them different is that they're Animated GIF files, that have a slight animation effect to make them stand out more. * 18 Guarantee signs (in Transparent PNG). There are 6 different colors and 3 different sizes. * 6 Guarantee signs in animated GIF. Same as above, but they come in Animated GIF format. * 468 Letters (in Transparent PNG). Cover all the letters in the alphabet from A to Z. Each letter comes in 6 different colors and 3 different sizes. You can use these as drop caps on your sales pages, you can spell things out with them, etc..
* 162 Numbers (in Transparent PNG). Go from 0 to 9. Come in 6 different colors and 3 different sizes each. Use these numbers to break down different modules, sections, bonuses, offers, etc..
* 360 Keyboard Signs (in transparent PNG). 20 signs x 6 colors x 3 sizes each. You can see all the different signs in the sample below. There are a lot of uses for these signs. You can put the quotes next to a testimonial or headline, the number sign next to a numbered section, etc..
* 96 Arrows (in Transparent PNG). Come in 6 colors x 4 directions x 4 sizes. The 4 directions are: up, down, left and right. * 126 Attention Headlines (in Transparent PNG). In 7 phrases ("The Bonuses, The Modules, Yours Free, Limited Time Offer, What You Get. One Time Offer, Special Offer") x 6 colors each x 3 sizes each. * 162 "Bonus" icons (in Transparent PNG). Bonus 1 - 9 in 6 colors each and 3 sizes each. * 36 Headers (in Transparent PNG). Simple website headers with round and square corners, in 3 sizes each (800px wide, 750 px wide, and 700 px wide), and in 6 colors each. You can add your own text to them in any graphics program. * 36 Footers (in Transparent PNG). Simple website footers with round and square corners, in 3 sizes each (800px wide, 750 px wide, and 700 px wide), and in 6 colors each. * 87 Blank Graphics Elements (in Transparent PNG). All the buttons and badges in this package also come in these "blank" graphics elements. So you can add your own text to these in your favorite graphics program (no special software required, use ANY graphics program you already use to edit these files). As you can see from the breakdown above, that's quite a lot of graphics files - 2,661 items in this package.